Good drinks, decent food, and a spectacular view... but it all comes for a hefty price. Red Sky features Bistro dining and a well stocked wine/martini bar. 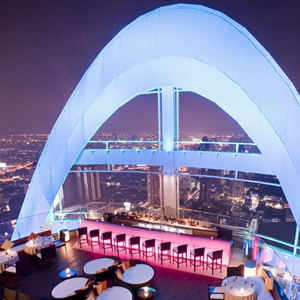 The views of urban Bangkok come framed with the tower's color-changing arc—which also serves as wind protection. It's probably one of the few rooftop venues where the ladies won't have to worry about their hair. Come at sunset, stay until dawn. Take BTS to Chit Lom and walk or take a taxi to Central World.